The staff of Community Solutions shared an inspiring work day with our partners, the Yellow Springs Children's Montessori Cooperative (YSCMC), on Monday, April 9. Parents and staff of the Montessori school joined with our staff and community members in what turned out to be a formidable crew. Our object—to clear a huge volume of invasive honeysuckle and dead ash trees from a 6,000 square-foot piece of Agraria chosen to host YSCMC’s summer program for children aged 3-6, beginning in June. We didn’t know what the work day turnout might be, given that we had to reschedule the event three times for the especially capricious Ohio spring weather. It was around 40 and had snowed all morning, though it melted before our scheduled start at 3pm. 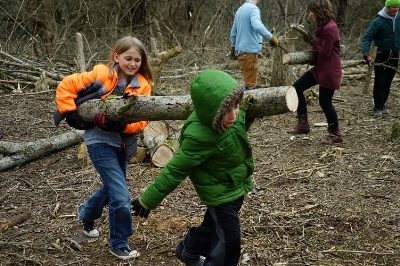 The work began, and the parents and other volunteers showed up in terrific numbers—we wound up with a crew of around 20 amazing brush haulers! We had not anticipated that the whole area could be cleared in one afternoon, but the wood seemed to fly off the ground as the crew felt a collective energy and excitement. 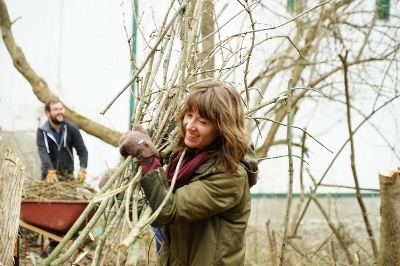 Agraria Property Manager Gabby Amrhein wielded a precise chainsaw wherever necessary. Incredibly, before the day was done, every branch and log had been carted or carried off! The sense of gratitude and accomplishment was palpable. For more photos, see our online gallery. This beautiful area is now ready to be cleared of stumps, carpeted with wood chips, and outfitted with work and play equipment for visiting children. These next steps will require continued volunteer help and community funding. We welcome your support—you can watch our events calendar or subscribe to our newsletter for upcoming volunteer days, and support Community Solutions financially by donating. To find out more about YSCMC, email ys.cmco@gmail.com or call (937) 769-5084.